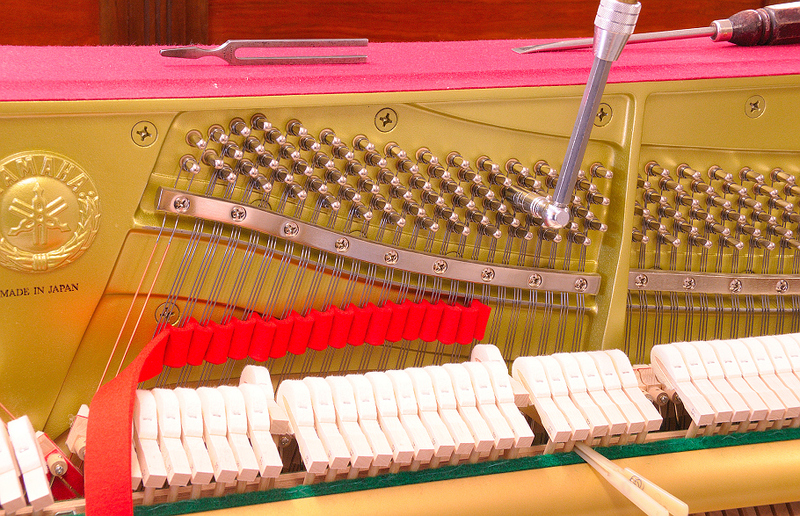 Our Piano tuning is done by ear, without using electronic tuner aids. Tuning by ear is by far the preferred requirement for the concert stage and music professionals. A concert ‘A’ 440 Hz pitch fork is used initially and then the temperament is set around this using the intervals, mainly fourths, fifths and octaves to tune and thirds, sixths, tenths, double and triple octaves to check. In time a piano’s pitch may drop quite considerably. A piano’s string tensions change as the soundboard and bridges swell and contract over time, with changing climatic conditions. They will drift sharp with high humidity, and drift flat with low humidity. New pianos need extra attention as the strings yield with time till they settle down. If very out of tune, the sound board will move under the new tension requiring a subsequent tuning. Tuning is an iterative process as the sound board moves during the tuning. Small adjustments to pitch help the piano to stay relatively stable. Old and dry sound boards can be re-tuned almost immediately, young or moist sound boards will creep slowly and need 3 weeks between. A piano should be tuned at least once or twice yearly to keep it beautiful. Occasionally there will be strings missing, broken, put on badly in the past and some may break unavoidably on tuning. Replacement cost will need to be negotiated as some treble strings are a minor job, middle strings can be a tricky job whilst the Bass wound strings require ordering, subsequent delivery and fitting and a further visit to retune as new strings yield with time and need to settle in. A standard initial tuning visit takes 1½ hours. Our tuning service includes some time for minor action adjustments, small repairs, pedal adjustment and cleaning of cabinet and keys where required. Over time, piano action deteriorates due to compression of felt, warping of wood and settling. Many new pianos are not perfectly regulated when released from the factory, or are affected when moving to their new home. Fine adjustments to the mechanism are made to achieve a heavier or lighter touch, better repetition, evenness across the keyboard. It ensures that playing parts respond in a smooth and timely fashion. Voicing a piano means regulating the sound of the piano to produce the most beautiful tone possible. It involves adjusting the hardness of the hammers to vary tone and intensity. Felt wear varies across the hammers as some are used more than others. It is also affected by the style in which the piano is played. Voicing and tone regulation changes the character and timbre of the piano's sound. We undertake hammer shaping, profiling and voicing to achieve either a brighter or softer tone evenly across the keyboard whilst adjusting the piano’s tone to suit a room’s acoustics and the player’s wishes.